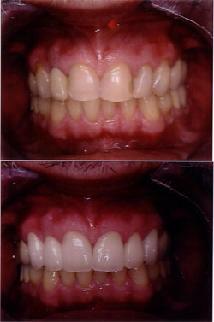 Teeth with chipping and spaces can be restored to its original look and function with Porcelain Veneers. Porcelain veneers are a great way to improve your smile. A veneer is a thin shell of porcelain that is bonded to the teeth to improve its color and shape. They cover only the front and top of the teeth. 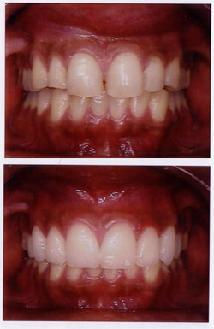 They can be used to close spaces between teeth, lighten dark teeth and lengthen short and misshapen teeth. In just two short appointments, a new smile can be achieved with porcelain veneers. The bond is extremely strong and you can use them like your natural teeth. Porcelain veneers never stain, so you will always have that bright smile. In the past, porcelain crowns used to be fabricated over a metal core, but this has several drawbacks. The dark metal does not allow for the light to enter the tooth and a dark blue line is seen at the gum-line. Now, with all-porcelain crowns, the problem of the dark blue line at the gum-line is eliminated. The ability to bond the restoration to the tooth makes this restoration outstanding and since no metal is used, it offers the best in natural appearance.